Western blot analysis of extracts from KARPAS-299 cells, untreated (-) or treated with calf intestinal phosphatase (CIP; +), using Phospho-ALK (Tyr1078) (D28B4) Rabbit mAb (upper) or ALK (C26G7) Rabbit mAb #3333 (lower). Cell Line Source: Dr Abraham Karpas at the University of Cambridge. Immunoprecipitation of phospho-NPM-ALK(Tyr138) from KARPAS-299 cell extracts, using Rabbit (DA1E) mAb IgG XP® Isotype Control #3900 (lane 2) or Phospho-ALK (Tyr1078) (D28B4) Rabbit mAb (lane 3). Lane 1 is 10% input. 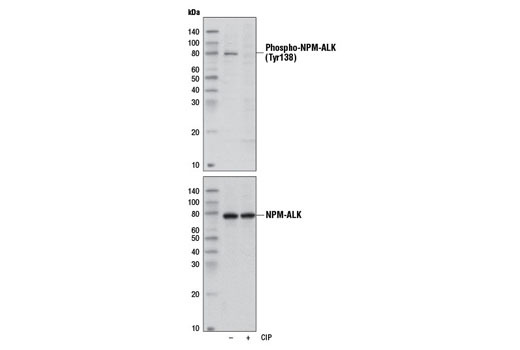 Western blot analysis was performed using Phospho-ALK (Tyr1078) (D28B4) Rabbit mAb. Cell Line Source: Dr Abraham Karpas at the University of Cambridge. 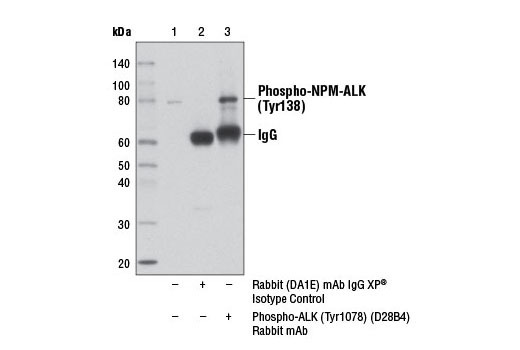 Phospho-ALK (Tyr1078) (D28B4) Rabbit mAb recognizes endogenous levels of ALK only when phosphorylated at Tyr1078, which is equivalent to Tyr138 of NPM-ALK. This antibody may cross-react weakly with other overexpressed phospho-tyrosine kinases such as EGFR and Src. Monoclonal antibody is produced by immunizing animals with a synthetic phosphopeptide corresponding to residues surrounding Tyr1078 of human ALK protein. Phosphorylation of ALK at Tyr1078 was identified at Cell Signaling Technology (CST) using PhosphoScan®, CST's LC-MS/MS platform for phosphorylation site discovery. Phosphorylation of ALK at Tyr1078 was observed in select carcinoma cell lines and in tumors.